My mornings are very competitive. I am at my best then – fresh water, brisk walk, green grass, sweet birds, fast squirrels, remarkable footprints, flying football, crispy newspapers, radio news, favourite music and then Darjeeling tea. Of course the bright Sun too. Added to these are status updates from my friends on BlackBerry Messenger, Facebook and Twitter. Family members also contribute to my morning smiles by sharing some beautiful tips they think would help make this world a better place. Voilà. 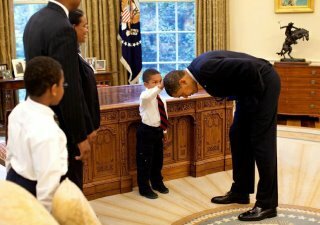 This Thursday, May 24, 2012, I also got to see some beautiful images that inspired me all the more, for the day… for sure. As a friend – Rashmin Tamhne – shared: Finished! Another honest hour’s walk!! 😉 … there were flurry of images, most of them very very energetic that scrolled on my desktop … one-after-another. One of the pictures read: A temporary worker visited US President Barack Obama with her family, just before leaving the White House. And look who obliged then! Well, some time, leaning over the bow does not mean to admit, the yield. White House also reminds me of music and concerts as over the past several years, dozens of musicians and performers have performed there in celebration of American musical culture. Will our Indian President’s Rashtrapati Bhawan or the Prime Minister’s 7 Race Course Road residence allow that? Huh! Hope they understand Indian music. Ok. By now you must have looked again and again at the photograph on top – of actors Smita Patil and Deepti Naval. How refreshing! Isn’t it! 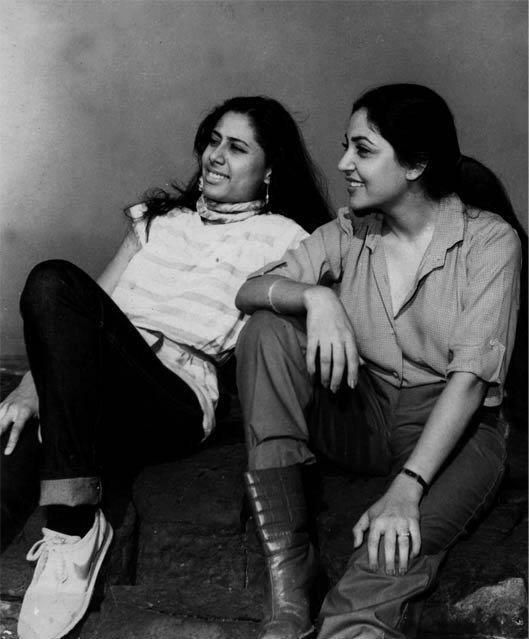 About this image, Deepti said: “A moment with Smita – back in the 80s – on a cloudy day at Band Stand.” How about their boots… Yeah!!! Film Critic Utpal Borpujari describes this photograph as — What a lovely photo…the carefree innocence of both shines through. Finally, here are the two poses that I spotted while surfing … mind-blowing: Have a look, a close look at the headstands. Wow! Simply… awesome. The first image of the ‘Up-Down’ is from “I Love Green Inspiration”, the next of the ‘Head-Stand’ is from “The Guimartinez“. This is one of my favourite posts on Greater Voice. It is so refreshing and so entertaining. I can almost paint a picture of a lovely morning with a nice cuppa of coffee in my hand. Hope you all enjoy it too. Very strong power of expression. I so enjoyed it. The pic of Smita Patil and Deepti Naval is fab! And your mornings sound very interesting!! My day kicks of with a huge mug of hot steaming chocolate milk.. and that’s what inspires me! Thanks. Liked ur idea too. lovely pic of Smita Patil and Deepti Naval..and strange good surprising ways of a starting of your morn!